Formed from the collapsed stratovolcano Mount Mazama, Crater Lake brings riders in from across the country. 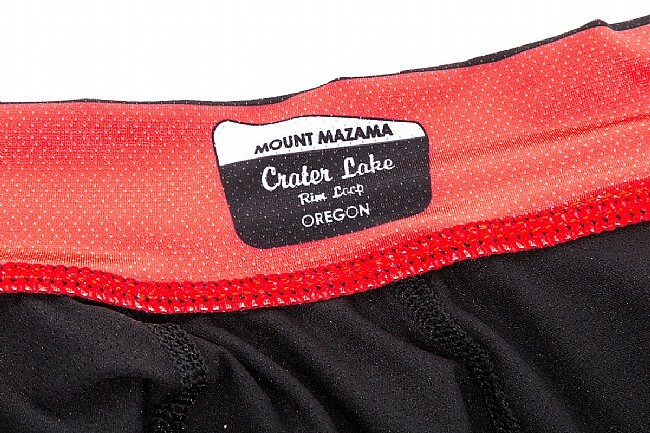 The ProCorsa Mazama Jersey draws its inspiration from Oregon's iconic destination and will stand up to the heat of the hardest rides in the hottest environments. Constructed from premium Italian fabrics sourced from M.I.T.I. 's industry-leading bluesign® certified factory, this lightweight, moisture wicking jersey also features larger mesh underarm panels and a full-length zipper for when things heat up. Designed for long days in the mountains, the 4-panel back won't sag or shift no matter how much the three large pockets and zippered multi-media pocket are loaded up. 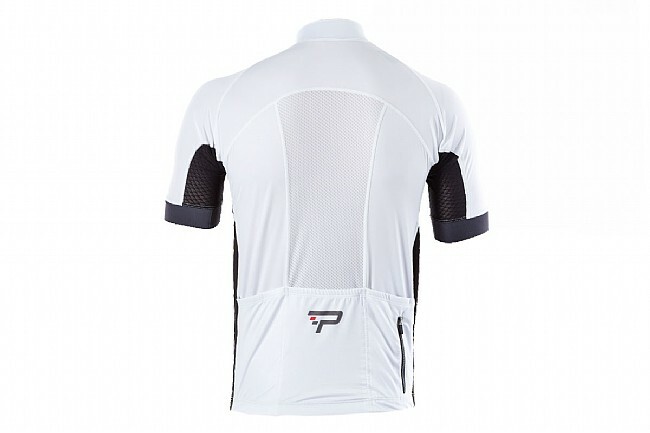 The white version of the Mazama Jersey features a large mesh rear panel for greater ventilation in hot weather. Chest 0" 35"-37" 38"-40" 42"-43½" 43½"-46" 46½"-49"
Waist 0" 29"-31" 32"-34" 35"-37½" 37½"-41½" 41½"-45"
Hips 0" 35"-37½" 37½"-40½" 40½"-43½" 43½"-46½" 46½"-49"
I wanted a dark jersey with safety highlights and I found it. Good price, great look and the weight and the feel is just awesome. Pro fit, cool and affordable. A really gd quality and design. The arm sleeves we're so small they cut off circulation. After trying out the black and yellow version, I also bought the white version. The style is fairly simple, but comes off looking clean and elegant. I particularly like the use of the colored zipper to match the trim color. 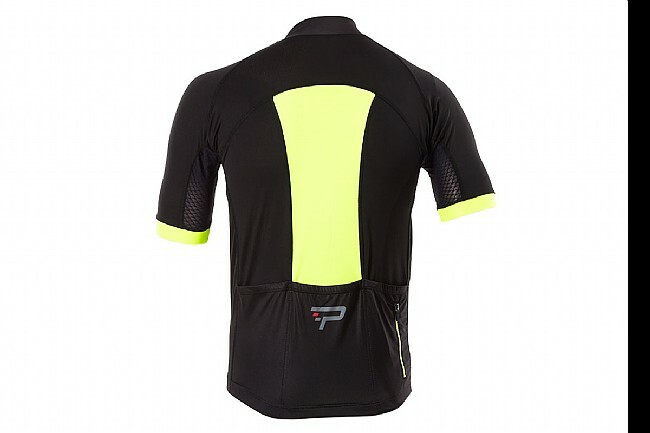 There are many features that put this jersey several steps above your typical modest priced jersey. The fabrics used are softer and stretchier than you'll typically find in jerseys in this price range - more similar to jerseys selling at twice this price. The problem with using stretchy fabric like this is that the back sags when the pockets are loaded up. Pro Corsa solves this problem by using a four panel back with vertical seams that prevent the sag. I've loaded my pockets with a heavy point and shoot camera with no sag. That's pretty impressive. The arm pits use a very breathable mesh material that's still very stretchy. The zippers (there is also a rear zip pocket) are heavier weight than you typically see on a a jersey - more typical of what you'd find on a light weight jacket. I LOVE this zipper. This is the first jersey I've every owned that is easy to unzip (even from the very top) with one hand. Yet it stays in place when you release it. The stretchy material allows a close fit without feeling like you're a sausage. The cut is probably more club cut than race cut, but it doesn't flap around. The sleeve cuffs on the loose side for me, but I prefer that over tight sleeves. The bottom hem features a nice silicon gripper. I bought the white jersey because we've had some really hot weather here in recently (and obviously expect more to come). The mesh back is great. This is the coolest jersey I've ever owned. Overall, the construction quality seems very good. I only have a couple jerseys that I've spent more than $200 on, but this jerseys seems comparable in almost every regard and is a bargain at the price. 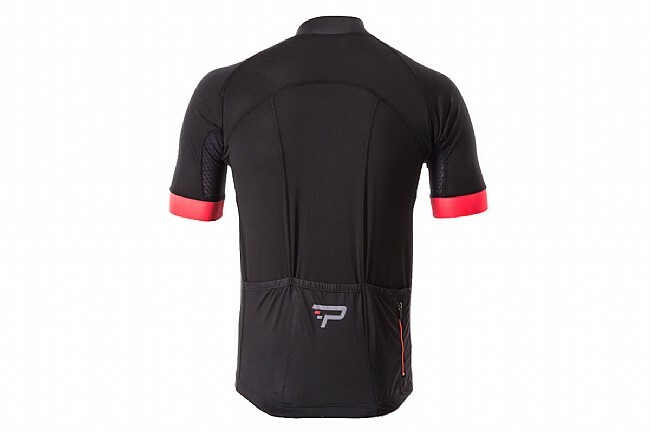 I ordered this on close-out at $43.99 - amazing price for a super high quality, conservatively styled jersey (unlike the Pearl Izumi stuff with all the weird, sketchy ziz-zag or pixelated elements). According the size chart, the Large should've fit, but didn't. Okay at chest and shoulders, almost okay at the gut, but somewhat too short, overall. I'm 5'9.5 and weigh between 175 and 180 without an overly large abdominal bulge. I'm returning the jersey and feeling a little bummed about it. Well made and comfortable. Fit is sharp, but not too aggressively tight - 5'916 medium fits well. Understated design, high quality zipper and good pockets. Would buy again. Needed another warm weather jersey and this looked like a good buy. 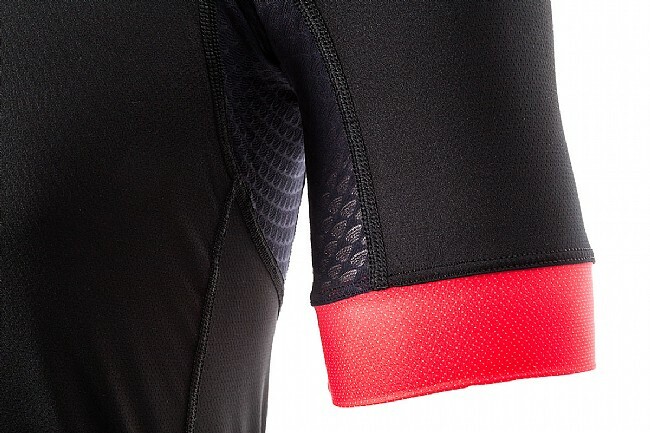 Fits like a traditional race jersey, snug but not super tight, like, say, a Castelli. 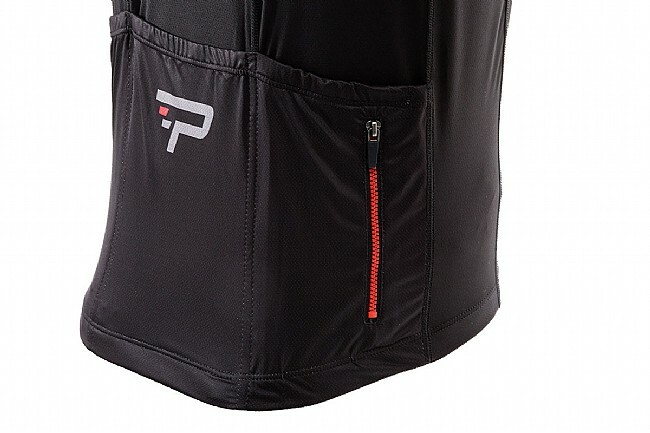 It's comfortable and good looking, the pockets are nice and big plus include a zip pocket for walletkeys, it has a nice, high neck for when it's cooler, the zippers are nice and beefy and the front zip is full-length, not the typical teeny-tiny Euro-style zips often found on bike jerseys. The only reason I don't wear this more is I can't handle the trim color. It's like magenta, almost pink on the sleeve ends and zips. Bike clothes are weird enough without going to borderline neon pink on what is otherwise a nice, understated jersey. I wish I'd bought the one with the white back, it's probably a bit cooler in the heat and not so much 'flair'. I will probably RIT dye this thing to all black so that I will actually wear it. Anyway, it's on me for purchasing this particular color combo but the description said 'redblack', so I figured I could live with that. I wish I'd exchanged it for another color combo, the whiteblack looks way better to me now that I've worn this one a few times. Form, fit, and function are excellent. 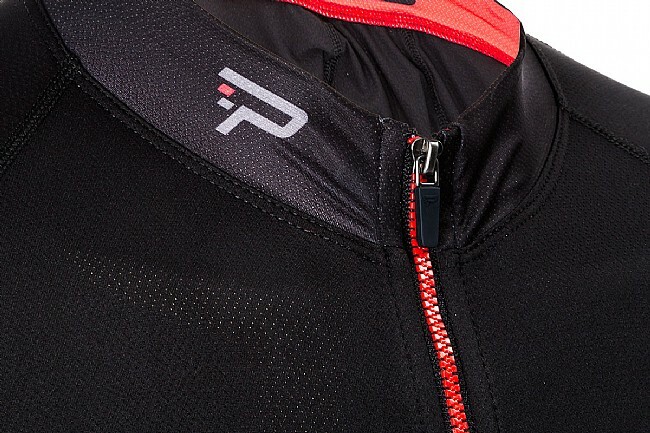 The zipper stays put, and is easy to manipulate while on the bike. The color stays fast, even after numerous washings. Rear pockets are fine, no sagging when loaded, snug when empty. The sale price made this purchase a no brainer, I purchased a second jersey two weeks later. Best jersey purchase to date. Was loyal to another make but quality and price suffered. High points- quality fit, zipper function, and no fade color fastness (so far). Purchased one, then another two weeks later. Form, fit, and function needs met. I got this jersey on the deal of the day,so it was cheap. 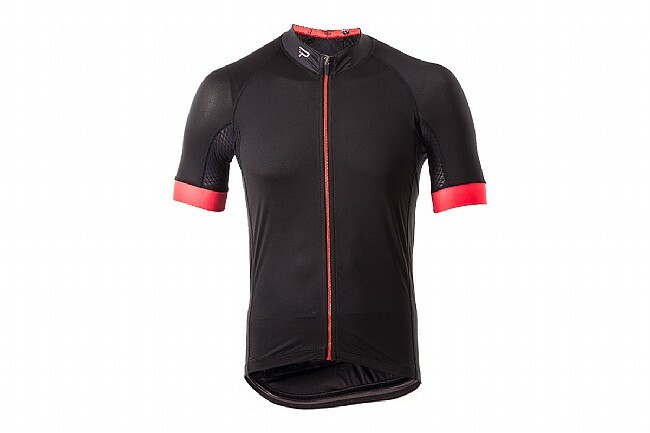 It is light with mesh panels under the arms , breathes good.I wear it on hot days and when I am climbing hills. It fits slightly snug ,not overly tight. Good fit. Not too tight but not baggy. Ventilated pits are nice. Zipper works well. Comfortable and well made. Zipper works well and is easy to use. Pockets don't sag. Great quality. Soft and stretchy fabric fits nicely without feeling too confining. Fit is similar to Pearl Izumi. Great zipper. Great zippers and zipper pocket. Super comfortable and breezy. I'm 6' 185lbs, average build, and wear a 33waist. The M is the smallest I could fit in to. I wanted it super tight and it stays in place and doesn't ride up on my lower back. As Ned Flanders said, feels like I'm wearing nothing at all...nothing at all. Nice quality, comfortable, and looks good. These are great jerseys. Not sure why they don't make a greater verity of jerseys. Nice fit I wear an XL (same as Pearl Izumi). Soft, stretchy material. Very comfortable. Nice style. We've had record temps here in SE Arizona the past couple weeks. I bought the white jersey to have something cooler to ride in. I love this jersey! The fabric is soft and stretchy so it fits very comfortably. Not super tight, but stays in place nicely. I love the mesh back panel which made the mid-90s temps a lot easier to deal with. Even with the pockets heavily loaded, the jersey doesn't sag. The full-length front zipper is heavier than you'd normally find on a jersey - more like the weight you've find on a jacket. The zipper is silky smooth and really easy to adjust one-handed, yet it stays in place when you release it. The style is relatively simple, but elegant, with a couple small logos. I'm definitely going to buy more of these. The fabric on this jersey is awesome. The fit is more of a club fit than a race fit and everything stays where it's supposed to stay. I bought the blackyellow and will be buying the whitegrey soon!